Hairy Mountain Folk: They're baaaaack! Having been so rudely evicted from their comfy home in the basement, our rodent house guests are back - this time they've taken up residence in the roof and have been making regular, brazen forays around the house. But I'm revising my first claim that these are bush rats - I now think they're antechinus, which is kinda cute except for the whole 'eating electrical cable' thing. 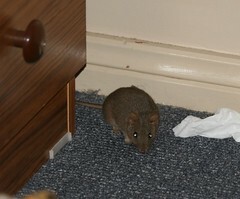 However, as cute, native and precious as these little critters are, their eating habits do not lend themselves to happy coexistence in our house, so I'm looking into trapping and releasing them elsewhere.